Sunday, August 23 1908 -- Long Beach is hosting a spiritualist convention, over a thousand 'spook charmers' (the Examiner's term) in attendance. A further thousand curious onlookers came to view the proceedings at an entrance fee of fifteen cents apiece. Connie, April 11 1937, courtesy of Cole Johnson. Will we be seeing the March 7 page? It was posted August 22nd. In the 1875 Rhode Island State Census, Cushing’s paternal grandfather, George W. Cushing, was the head of the household. Cushing was the second of three sons born to Harry and Martha. His father was in the U.S. Army. They resided in the town of Warren on Washington Street. The Cushing household was recorded, in the 1880 census, in Providence, Rhode Island at 5 George Street. Information regarding his childhood schooling has not been found; in Life magazine, he said: “…In my boyhood I was hurried from post to post, from North Carolina to Alaska.” He graduated from the Bulkeley School in New London, Connecticut in 1887, according to a listing on page 19 of the 1888–89 school catalogue. Cushing said his art studies began “…in Boston at the Art Museum and later at the Academie Julien, under Constant and Laurens.” On December 16, 1891 he applied for a passport while in Paris. Earlier he had departed from the U.S. on October 7, 1891. He intended to return within three years while he took time to travel. His description was five feet eight-and-a-half inches with hazel eyes and brown hair. A passenger list at Ancestry.com said he arrived in New York, from France, on May 16, 1892. Painter was his profession. At some point he went back to Europe and returned, as a student, to Boston in September 1893. Sometime after his return, he was an assistant in freehand drawing at the Massachusetts Institute of Technology. The MIT Annual Report of the President and Treasurer, December 12, 1894, said Cushing and others “…have terminated their connection with the Institute.” The school’s yearbook, Technique 1895, listed him as an instructor. Mr. Otho Cushing, so well known here, and Miss Augusta Hunter gave a Spanish dance at the big society entertainment in Newport on Tuesday night for charity which brought down the fashionable house. Mr. Otho Cushing, formerly of Boston, brought down the house at every performance of “The Lady from Chicago,” given by the “Stroller” in the Astoria ballroom last week, by his dancing with Miss Emily Hoffman. It could not have been excelled on any professional stage. Mr. Cushing made almost as much of sensation as he did by his appearance in the historically correct, but rather realistic and airy, costume of a 14th century court falconer at the famous Bradley-Martin ball. Boston figured prominently at an art reception given yesterday at the Deblois cottage by Maj. H.C. Cushing, U.S.A., formerly of Boston, and now one of the assistants to Col. Warring in the street cleaning department in New York, and Mrs. Cushing, in honor of their son, Otho Cushing, a rising young artist, who exhibited his pictures for the first time. Mr. Cushing showed portraits of his father and mother, Miss Mary L Barnard and Miss Gretchen Welch of Boston, Miss Bradhurst and H. Archie Pell of New York, Count Longay of Buda Pesth, Baroness Danckelman of Vienna, Miss Jessie Hunter and Mrs. George H. Norman of this city, Mrs. T. Owen Berry of Asheville, N.C., and O.W. Budd, U.S.A. The portraits were universally admired by those who viewed them, including many of the summer residents and army and navy officers and their wives. Six drawings by Cushing were published in Life’s Comedy (1898). He contributed a drawing to Corks & Curls (University of Virginia, 1899) which appeared on page 34. The 1900 census recorded artist Cushing, his parents and two servants in New Rochelle, New York on Wild Cliff street. A March 8, 1901 passport application in Athens, Greece, showed that Cushing departed the U.S. on February 14, 1901. He intended to do further traveling for two months. Brush and Pencil, February 1903, devoted five pages on Cushing’s drawings. For the New York Herald he produced several panels: Marriage a la Mode a Century or Two After Hogarth, November 8, 1903 to January 24, 1904; A Week End Party, January 24 to February 26, 1905; When Diana Came to New York, April 23 to July 2, 1905; and The Evolution of Mrs. Newgold, August 27 to October 8, 1905. The New York Times, October 15, 1942, said Cushing went to Paris and was art editor of the European edition of the New York Herald. 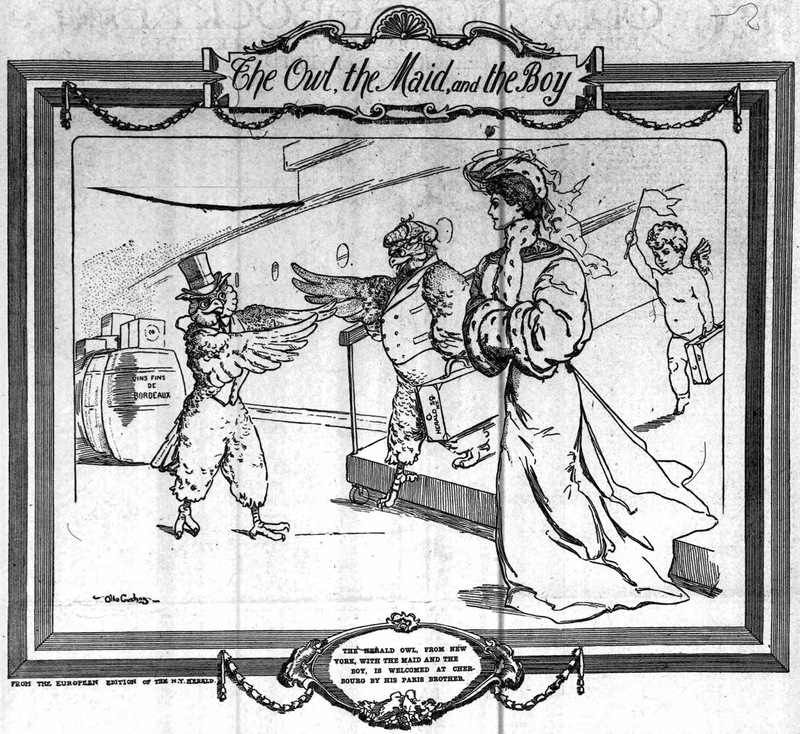 His panel, The Owl, the Maid, and the Boy, for the European edition was reprinted in the February 21, 1904 stateside edition. After his work for the New York Herald, Cushing joined the staff of Life magazine. His cartoons of President Theodore Roosevelt, parodying the adventures of Ulysses, were collected and published as The Teddyssey in 1907. The 1910 census recorded Cushing, a magazine illustrator, his widow mother and younger brother, Nicholas, in New Rochelle at 18 Neptune Place. Cushing’s father had passed away July 2, 1902, according to the New York Herald. The 1915 New York State Census recorded the Cushings at the same address. About a quarter mile away, on Mt. Tom Road, were the illustrators Frank and J.C. Leyendecker. In the 1918 New Rochelle City Directory, Cushing’s address was 4 Harbor Lane. During World War I, the Times said Cushing served “…overseas as an Army Air Corps captain, supervising the camouflaging of American airfields on the Western Front.” HIs name was listed in Aerial Age Weekly, March 24, 1919, and Air Service Information Circular, June 5, 1920. Cushing has not yet been found in the 1920 census. His residence remained unchanged according to the 1929 directory. The 1930 census recorded Cushing, his mother and brother in Manhattan, New York City at 117 West 58th Street, where they rented an apartment. Sometime before 1940, his mother passed away. Cushing and his brother had returned to their New Rochelle home according to the 1940 census. Funeral services for Otho Cushing, artist and cartoonist, will be conducted at 2:15 P.M. tomorrow at the George T. Davis Memorial, 14 Le Count Place, New Rochelle. Mr. Cushing died on Tuesday [October 13] in New Rochelle Hospital. He lived at 4 Harbor Lane in New Rochelle and was 71 years old. Mr. Cushing was best known for his work in the old Life magazine. He drew humorous drawings of persons in ancient Greek costume and did a series of cartoons on the activities of President Theodore Roosevelt. In recent years he devoted his time principally to water colors, many of them on historical subjects. He was born at Fort McHenry, Md., a son of the late Major Harry Cooke Cushing and Mrs. Martha Wetherill Budd Cushing. He studied at the Boston School of Fine Arts and the Julian Academy in Paris, and served for many years as a professor of drawing at Massachusetts Institute of Technology before joining the staff of Life. In the world war he was made a captain in the Army Air Corps. Surviving is a brother, Nicholas Cooke Cushing of New Rochelle, a naval architect in New York. Robert Sterling Grable was born in St. Louis, Missouri, on September 8, 1871, according to his death certificate. Grable started out in business as a newsboy, selling papers on the street. He later became circulation manager of the St. Louis Star, and then climbed the ladder of success on higher. St. Louis city directories listed Grable, his occupation, employer and residence. The earliest directory listing, found so far, is from 1889 and said his trade was “Candy” and he resided at 2707 Madison. The following year he was a collector at the Sayings Company and at the same residence. In 1891, he was a clerk at the Star-Sayings Company. Grable had the same position in 1893 and lived at 4106 Lucky Street. In 1895 Grable had moved up to superintendent of circulation at Star-Sayings and his home address was 4049 Juniata. Grable was the manager of circulation at the St. Louis Star in the 1897 directory and moved back to 4106 Lucky Street. Bold capital letters highlighted his rise to Assistant Business Manager in 1899. 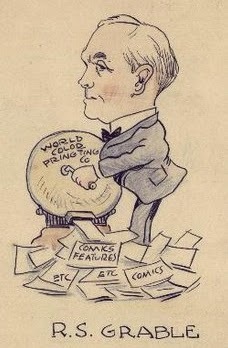 A number of cartoonists supplied material to World Color; they include Johnny Gruelle, Carl Ed, Rube Goldberg and George Herriman. In the 1910 census Grable was publisher of the newspaper; he and his wife had their own home in St. Louis, 4957 Fountain Avenue. Grable’s occupation was printer in the syndicate industry as listed in the 1920 census; he lived at 219 Portland Terrace in the Carondelet neighborhood of St. Louis. The World Color Printing Co., 714 Lucas Avenue, St. Louis, Mo. Manager, R.S. Grable. Publishes daily and Sunday mat features, including colored comic supplements. Prints four pages of magazine features complete, fiction page, clever stories, fashion page, crochet lesson, sketches from life, and features for children, such as “Bedtime Pencil Pictures,” “Three Little Pigs,” “Uncle Joe,” “Grandma's Yarns,” etc. Payment by arrangement. A similar but shorter description was found in How to Sell Manuscripts (1920). 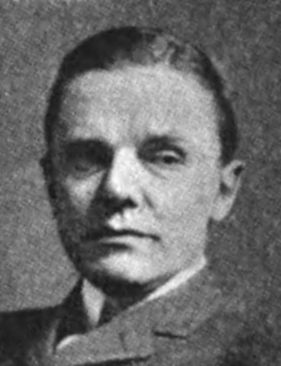 Grable’s name appeared in advertisements published in Editor & Publisher, January 22, 1921 and April 22, 1922. 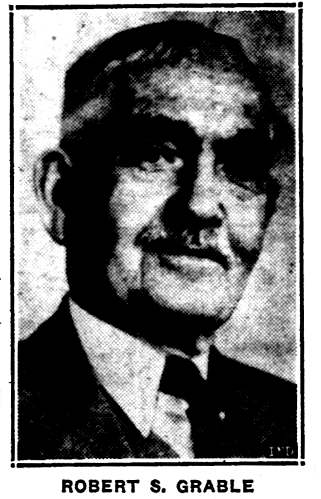 Grable’s fiftieth birthday party was reported in the January 6, 1922 edition of the Boyden Reporter (Iowa). Artist Cobb Shinn drew pictures on the large paper hats given to the 75 children at the party. World Color Press was founded in 1903 when the owners of the St. Louis Star formed a company to handle the color printing for the Louisiana Purchase Exposition, the World's Fair to be held in their city the following year. They named their wholly owned subsidiary World’s Fair Color Printing, expecting to disband operations at the conclusion of the event. After the fair closed, however, they shortened the company name to World Color Printing and continued to do business as a commercial printer, focusing on a new and unique product, the color “funnies” section of the Sunday newspaper. Under the leadership of Robert Grable and Roswell Messing Sr., two senior employees from the Star who purchased the company in 1922, the fledgling organization grew steadily over the next two decades as the popularity of the Sunday color comic section increased. By the early 1930s, the company’s profitable niche business had grown to include printing contracts with papers from Florida to Hawaii. World Coloring Printing Co., Inc. (est. 1900), 420–428 De Soto av. ; tele. COlfax 2250. Robert S. Grable, pres. ; Roswell Messing, v.-p.-treas. and buyer; J. Clarence Taussig, sec. Publishers and printers of comic supplements, rotagravure art sections, etc. ; rotogravure printers. The Independent, March 10, 1945, noted the company’s expansion into printing comic books. History of the comic books only dates back to the late thirties, according to Grable. It was in 1938–1939 that his company put in new buildings and equipment to take care of the new field in comic literature. According to the 1940 census, Grable resided at 761 Kirkham Road in Glendale, St. Louis County, and was president of a printing company. The paper shortage during World War II affected World Color Printing. An excerpt from Grable’s letter to the Sioux County Capital (Iowa) was published on the front page July 27, 1944. Due to manpower shortage and other conditions over which we have no control, we are forced to discontinue 7-Star Comic as of July 15th. We regret the necessity of discontinuing the service but it just can’t be helped. No longer in the newspaper comic business, it is now the largest printer of comic books in the country, Grable explained. Among its publications are Dagwood, Mr. District Attorney and Casper. 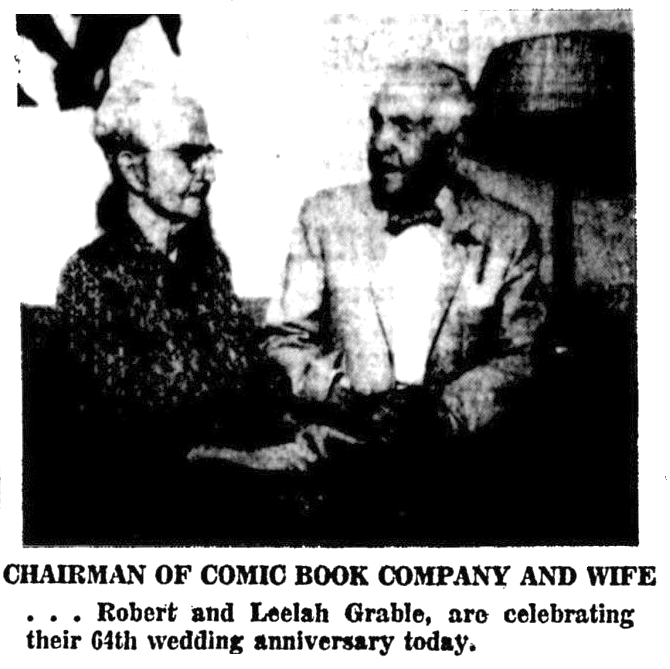 Grable’s wife, Leelah, passed away April 10, 1958. Grable passed away April 27, 1960, in Kirkwood, Missouri. The death certificate said the cause was “massive acute myocardial infarction”. An obituary was published in the St. Louis Post-Dispatch the following day; it is available at the St. Louis Public Library. Grable was buried at Oak Hill Cemetery. Paul Moore discovered these interesting news stories about Robert S. Grable, head of World Color Printing. There is some interesting new information here (new to me anyway). I'll discuss that at the bottom of the post. All of the following stories are from St. Petersburg (FL) papers, which wrote them because Grable was a prominent snowbird in that community. Thanks so much to Paul Moore for these! Merchants of the United States are realizing the favorable psychological effect that color exerts on their customers, according to Robert S. Grable, president of the World Color Printing company of St. Louis. Grable's concern In St. Louis prints colored comics, advertising sections, feature pages, etc., for newspapers all over the world which cannot afford the expensive equipment necessary in this type of work. He is visiting here with friends at 315 Eighth avenue north. "Color enables a newspaper or magazine to reach a greater number of readers, consequently benefitting the merchants who advertise," he said. A certain percentage of readers will read black and white printed matter regularly, but when color is added the colored portion will attract a larger number of readers because it stands out from the mass about it, Grable has found. "Colored comics have been one of the greatest boons to newspaper circulation, and resulting advertising success, in the history of the daily press," Grable said. "Whereas the black and white sheet is read by the adults of a family, the colored sheet is read by the children, too, and they are potential customers of the advertising merchant." Printing of ready-made colored comic sections formerly composed 95 percent of his concern's business. Now It is only 5 per cent, because many papers have installed their own color printing equipment. However, Grable had been keeping up with the times, and found something new in the color printing line to keep his concern going. Grable started out in business as a newsboy, selling papers on the street. He later became circulation manager of the St.Louis Star, and then climbed the ladder of success on higher. The World Color Printing company was at first a branch of the St Louis Star, but when that paper was sold some years ago the color printing company was kept separate, with Grable as its manager. He later bought out other interests. 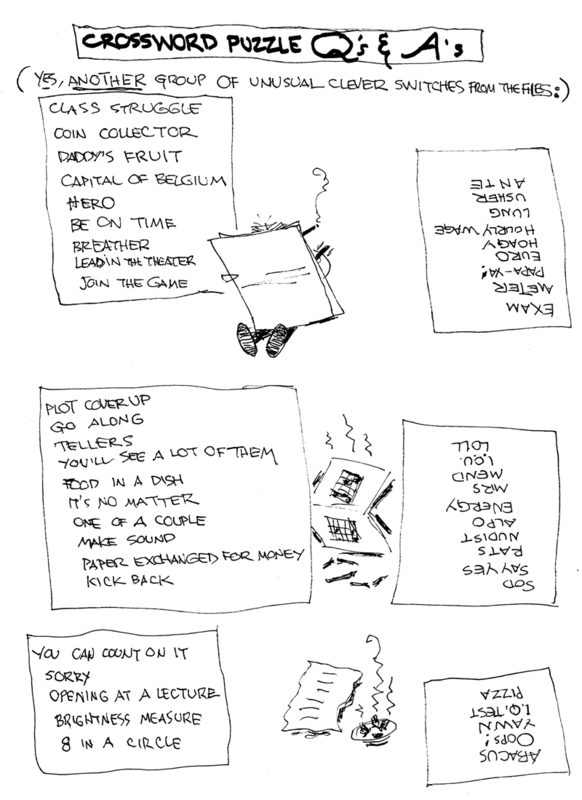 The concern prints such comics as Slim Jim, the Kelly Kids, etc., and through a working arrangement with the Bell syndicate prints Tailspin Tommy, Mutt and Jeff, the Nebbs, Don Winslow, High Lights of History, Keeping Up With the Joneses, and others. Robert S. Grable, magazine publisher, who is to the comic book business what Kaiser is to the shipbuilding industry, was in St. Petersburg on a brief visit yesterday and expressed the opinion that the comic book business, which has in the last few years had a jack-in-the-box rise, is here to stay. Owner of the World Color Printing company In St. Louis, Mo., Grable pioneered first in ready-printed color comic strips for the Sunday newspaper supplements and when later most newspapers installed their own presses for their "funny papers," stepped out among the first to publish such pulps as "The Green Hornet" "Zip" and "Suspense." Comic books, of which there are about 130 in the field, have a monthly circulation of 50,000,000, Grable says, and seem definitely to have become a part of the American scene, if not the national literature. The World Color Printing company puts out some 25 different comic books with a detective number, accounting the trials of "Archie", taking a first place position with a circulation of 1,000,000 copies. History of the comic books only dates back to the late thirties, according to Grable. It was in 1938-1939 that his company put in new buildings and equipment to take care of the new field in comic literature. The publishing house also prints eight or nine "more dignified" monthlies, he adds. Publisher Grable – “spelled just like 'Betty's last name” is a cousin of the famous actress and admits that new acquaintances invariably end up talking to him about the Hollywood star rather than the comic book business. Grable and his wife are wintering in Clearwater and were here yesterday to see Grable's old friend, James Wright Brown of Editor and Publisher. Clearwater - Mr. and Mrs. Robert S. Grable, winter residents for the past quarter century from St. Louis, Mo., are celebrating their 64th wedding anniversary today. They were married in Louisville, Ky., Feb. 12, 1891. He is now 86 and she is 81. On Sunday they will further mark the occasion with a dinner party at their home, 1336 Sunset Dr., for a group of relatives in the area and a few close friends. Appointments of the table will be enhanced by an anniversary cake centerpiece and arrangements of spring flowers. Invitations were sent to Mr. and Mrs. Dan Stoutamire, Grable Stoutamire, Mrs. Anna Grable, Mr. and Mrs. Hugo Shoemaker, Miss Julia Gehm, Mr. and Mrs. Arnett Brown, and Mrs. Marie Waters. In addition to relatives well-known in the up-county area, Grable and the late Tom Grable, father of the world-famous Betty Grable, were first cousins. Most noteworthy, in addition to 64 years of married life, is Grable’s active business life. He is by no means retired. As owner-director of World Color Printing Co., he even directs the operations of his firm by long-distance telephone during his three months in Florida each year. He began his business career as circulation manager for the St. Louis Star. He was a charter member of the National Circulation Managers Assn. in 1899 and is now one of the few living charter members. In the early 1900s he founded World Color Printing which supplied more than 80 per cent of the newspapers in the nation with colored comic supplements for their Sunday editions. Among these was the St. Petersburg Independent a few years after the turn of the century. He recalls that the Miami Herald used 10,000 comic sections in 1904 and now uses 600,000. With a Philadelphia editor who wanted comics with the text in German, he originated the first foreign language comic sections after 1910. After World War I this service was taken over by Hearst publications. In 192[number obscured] he also originated the invisible color book used as a tabloid section in a number of large papers in the East and Midwest. In this the black and white printing, treated with water, emerged in full color – a very popular operation with the small fry of the day. When newspapers started printing their own “funnies” or consolidated with other papers on this feature, World Color Printing went into comic book publication and now prints 1,300,000 every day. However, the company still does the comics and the tabloid TV guide for the St. Louis Post-Dispatch. Grable’s company also prints Billboard, Sporting News, the Army, Navy and Air Force Times, and a number of other magazines. 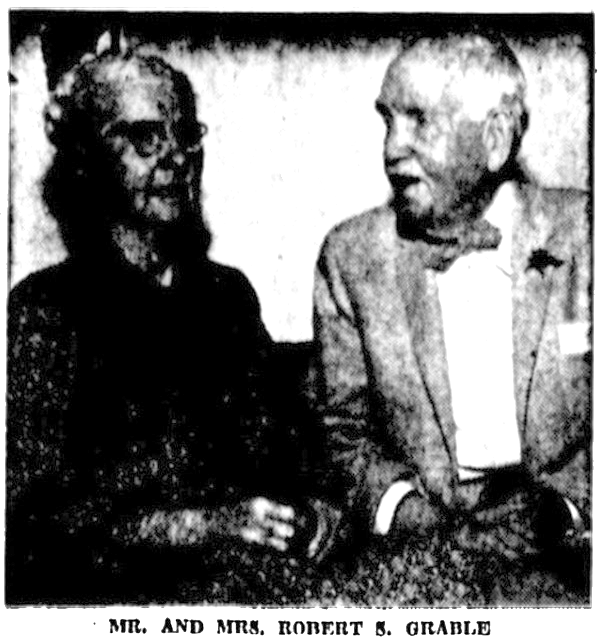 Clearwater -- The chairman of a syndicate which supplied The St. Petersburg Times with comics in 1903-1904 is celebrating his 64th wedding anniversary today. Robert Grable, 86, and his wife Leelah, 81, 1732 Sunset Drive, Clearwater, met a a Louisville, Ky., Sunday school February 12, 1893. They were married a year later. 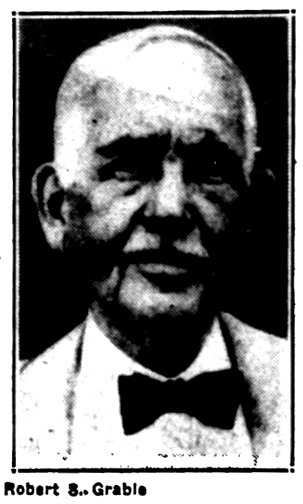 During the interim, Grable took a train from St. Louis, where he was working, to Louisville every other month to visit his bride-to-be. "It was love at first sight, though neither of us knew it at the time," Grable said. "We are optimistic about celebrating our diamond anniversary (the 75th)," Grable said. "The Lord has been good to us." Practically every newspaper in the United States, Grable pointed out, has been a client of his firm, the World Color Printing Products (sic), St. Louis. 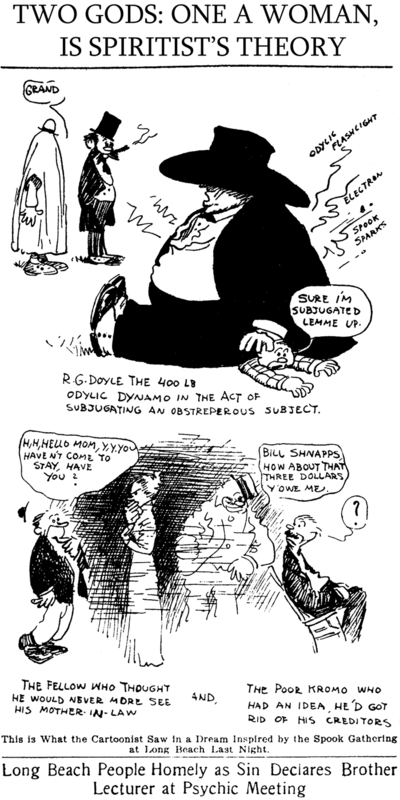 Gable hired comic artists from newspapers, and sold their services to other newspapers which could not afford artists of their own. Rube Goldberg and George Harriman (sic) were among the people Grable employed. The Grables have been coming to Clearwater for the winter for the past 25 years. So, what new information is here? First, I had no idea that World Color took refuge in the comic book printing business when their Sunday sections became unprofitable. I was under the impression that printing of The Sporting News was their main source of income later on -- obviously that wasn't the case. Apparently I'm slow on the uptake in this regard, as the Wiki entry on World Color Printing covers this aspect of their business. Second, I was not aware that WCP had some sort of business arrangement with Bell Syndicate in the late 1930s (2/13/37 article). Was Bell offering pre-printed sections that featured just their comics? 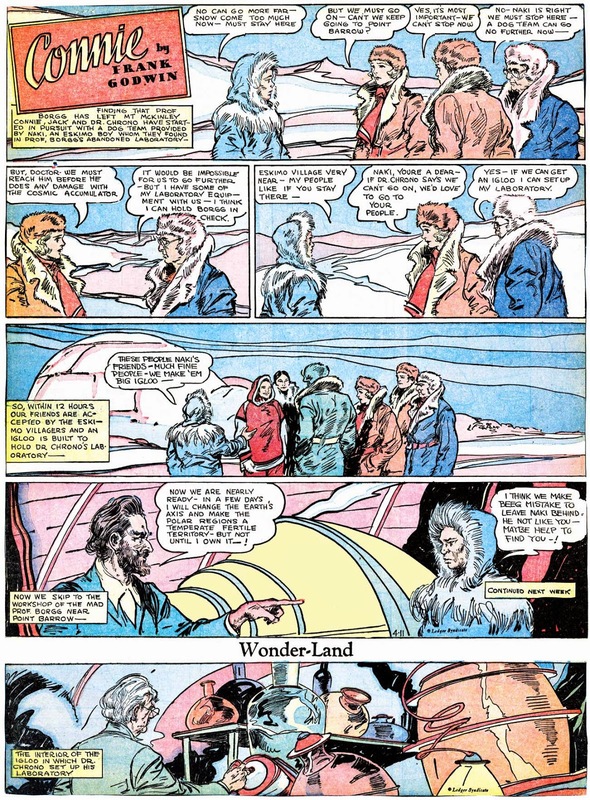 Come to think of it, the way these strips were presented in the 1930s, I do recall that you sometimes see them printed on a singularly rough quality of pulp paper, cut slightly larger size than normal -- is that evidence of World Color pre-printing? Does anyone else share this idea, or am I making up facts to fit a conclusion? Third, I wonder about the mention of a German language comic section from WCP in 1910 or so. The idea that it was the first of its kind would seem to be false on the face of it, since Hearst's German language section was available long before that. However, maybe Grable is saying that he was producing a German section of original material? In any case, I've never seen a WCP section printed in German. Have you? 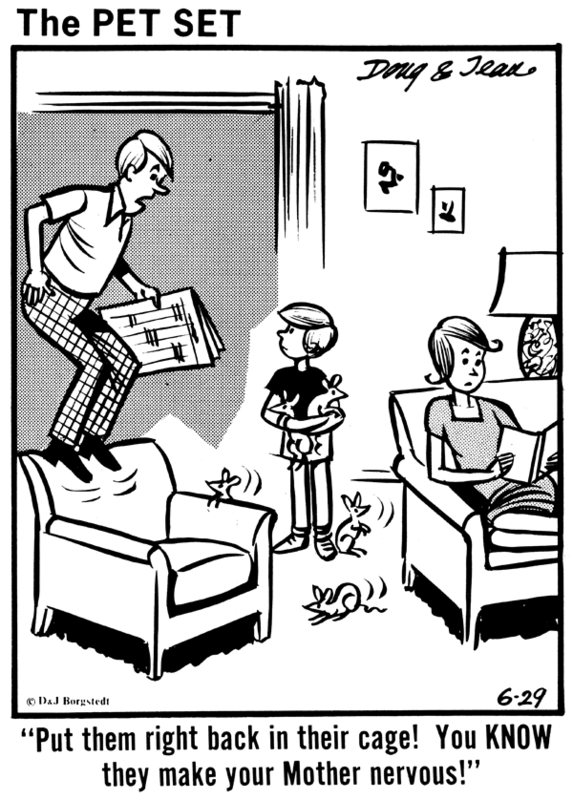 Fourth, it's nice to know that WCP still kept one toe in the newspaper comics world, printing the St. Louis Post-Dispatch comic section even in the late 1950s. The date of the INVISIBLE COLOR was 1922. The Washington Evening Star carried this Sunday feature from May/28/1922 through Jul/16. It probably began elsewhere at least as early as Mar/26. Seems to have been very short lived. It is based on U.S. patent 1384663, awarded Jul/12/1921. Thanks for reminding me of the Invisible Color sections. Always meant to look a bit deeper into their history, and you gave me the push I needed. Found enough interesting bits that I am working on a blog post about it. Look for it to appear here sometime in March. 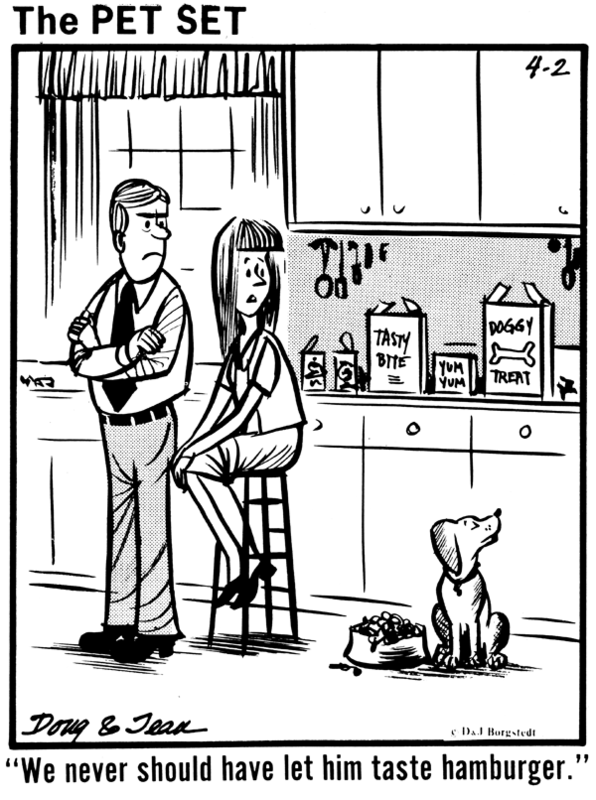 Doug Borgstedt was pushing retirement age when he and his wife Jean came up with the idea for a newspaper cartoon series targeted towards pet owners. 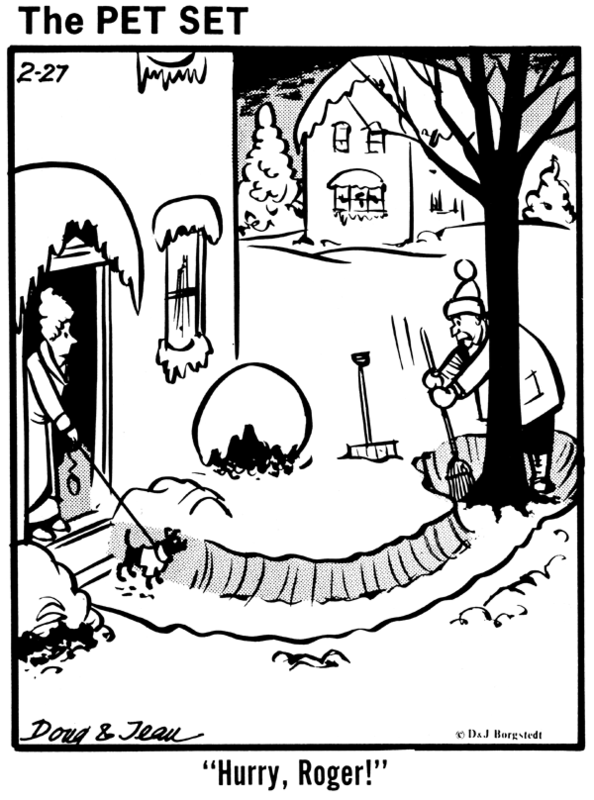 This was, though, by no means Doug's first foray into cartooning -- far from it. Doug Borgstedt had a varied cartooning career. I'm told that before World War II he produced editorial cartoons for the Philadelphia Evening Ledger, then the Philadelphia Bulletin (though he omits these credits in a 1964 E&P article). In the 1960s he was syndicated nationwide by King Features and later by Copley Press as an editorial cartoonist. Meanwhile Borgstedt drew up lots of gag cartoons, and his work appeared frequently in high profile magazines like Saturday Evening Post, The New Yorker and Collier's. During World War II, Borgstedt was in the army and worked on Yank magazine. 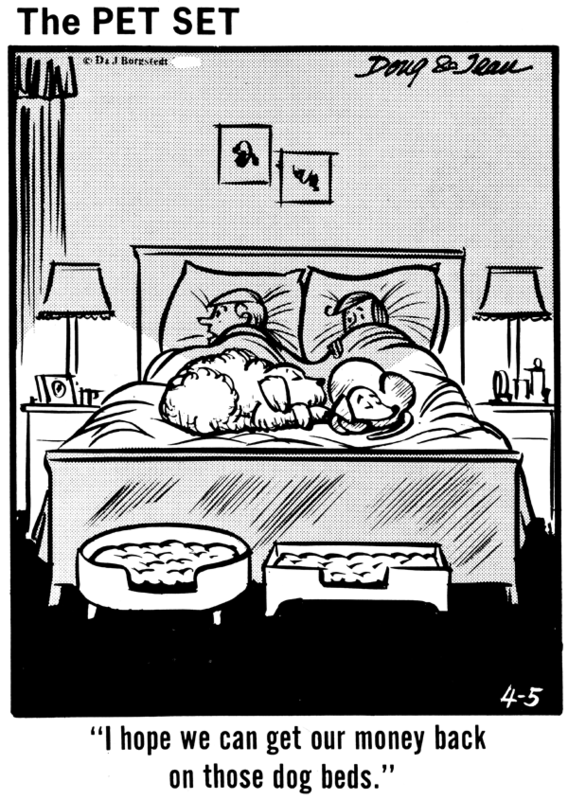 With his editorial cartooning career winding down, Doug evidently was looking for other opportunities when he and wife Jean decided to collaborate on this self-syndicate panel series, The Pet Set. Pets certainly gave them lots of gag opportunities, and the panel is pretty consistently funny. The art, presumably by Doug, gets the job done but nothing more (but Borgstedt was never much for style -- he was more concerned with the ideas). The daily series is hard to track. It is a rare paper that ran the feature consistently, but Mark Johnson reports the earliest he's discovered is January 17 1973 in the Philadelphia Bulletin. A reprint book of the cartoons (Pet Set Cartoons -- 1977 by TFH Publications) cites copyright dates starting in 1972, so there may be earlier appearances lurking out there. The feature was advertised in E&P until 1983, though I have my doubts that the Borgstedts actually produced a decade's worth of material. My bet is that they were selling material that was already in the can for a good part of that time. Doug also did cartoons for Editor and Publisher in the 1970s. Why do you think they were selling material that was already in the can much of the time, for The Pet Set? I'm not saying you're wrong. Just wondering why you think that. With a very small and seemingly ever-changing client list, I just can't see Borgstedt working to produce 6 panels per week for years on end for this project. The feature has the distinct smell to me of one where a limited amount of canned material was made available to papers. Of course, if Borgstedt had landed a few major clients who actually printed Pet Set daily, I don't doubt that he would have produced more material.